On a typical Sunday, Father Rod Bower draws about 200 people to his church service in a coastal town in Australia. But online, his messages are often viewed by millions. 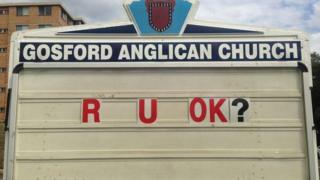 For years, he has been posting provocative statements on a roadside billboard outside his Gosford Anglican Church in New South Wales. Spelled out in 30cm (12in) block letters, his opinions - typically on progressive issues - have gained global attention on social media. One of his most shared comments followed the Parkland, Florida school shooting in February, when he wrote: "When will they love their kids more than their guns". His Facebook post on the billboard was viewed by more than three million people, and picked up by US news outlets. He has more than 70,000 followers on social media and "a higher engagement rate than the prime minister", he says. Fr Bower has served at the church, 75km (50 miles) north of Sydney, for nearly 20 years. He wrote his first trademark billboard only in 2013, after performing dying rites for a gay man. The priest later learned that the man's partner had been kept away because his family feared offending the church. "I was so disturbed by the culture that would have led people to believe that, that when I got back to the church I went and put up that sign," Fr Bower told the BBC. It read: "Dear Christians, some ppl are gay, get over it, love God". Fr Bower estimates that it was seen by as many as 50 million people on social media. It spurred him to write posts on other topics. "We have this instrument out the front that when combined with social media helps do what the Christian church should be doing, and that is creating a more just society," he says. "That is the gospel, that's what Jesus was on about - challenging injustice, lifting up the poor, including the excluded." Some messages have called for greater action on climate change, or offered sympathy after tragedies overseas. But many of his opinions focus on Australian issues, such as the nation's controversial policies on asylum seekers who arrive by boat. Australia does not allow asylum seekers who arrive by boat to stay in the country. It turns back vessels at sea when it deems such action is safe, and sends asylum seekers to offshore processing centres. Canberra defends both policies as deterrence strategies that save lives at sea, but others, such as Fr Bower, argue that they are harmful. One of his aims, Fr Bower says, is to break a perception of the Anglican Church as a solely conservative institution. But he acknowledges that his activism is not wholly embraced by some in his congregation, or among Anglicans more broadly. "Certainly some of the more conservative folk were deeply uncomfortable [when I first started] and some still are, but I always try and explain - as a Bible-believing Christian - that these are the teachings of Jesus," he says. He estimates that he has lost a handful of worshippers because of his opinions, but "a great many more have come" because they "resonate with the message". He has never been asked by his church superiors to remove a message, Fr Bower adds. But an assistant archbishop last year did criticise a billboard singling out a government minister, which he said was "a very personal slur". He has drawn vocal critics. One conservative newspaper columnist, Tim Blair, described him as a "hectoring Anglican" with a "holy message board of sanctimony". In 2016, right-wing protesters stormed his church during a Sunday mass, wearing mock Muslim outfits and shouting anti-Islamic slogans. Fr Bower had previously offered messages of support for the Muslim community. But he says he has only been emboldened by such incidents. "When priests speak out in support of those who are outside what is perceived to be their sphere of self-interest, that voice is perceived as having an enormous amount of integrity," he says. "And people deep down resonate with integrity."